Partial Head, Walking Head & Extra Ear. The EXTRA EAR has now been constructed on my arm. A right ear on a left arm. 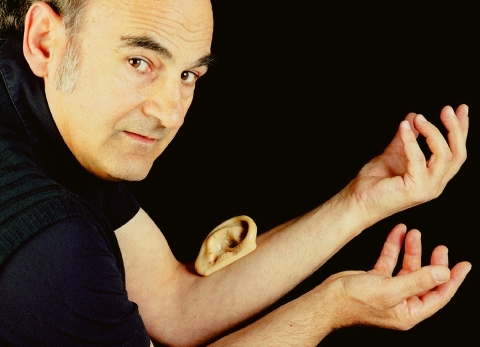 An ear that does not hear but transmits. A facial feature has been replicated, relocated and repositioned elsewhere. Excess skin was created with an implanted skin expander in the forearm. By injecting saline solution into a subcutaneous port, the kidney shaped silicon implant stretched the skin, forming a pocket of excess skin that was used in surgically constructing the ear. When electronically complete it will form part of a distributed bluetooth headset. I will be able to speak to the remote person through the Extra Ear but will hear the sound of the person speaking to me in my mouth. If my mouth is closed only I will be able to hear them. If I open my mouth and someone is close by, they will hear the sound of the remote person from within my mouth. The PARTIAL HEAD was a project that was generated from the image of the flattened digital skin that was made for the PROSTHETIC HEAD (a computer generated head that speaks to the person who interrogates it). But with the PARTIAL HEAD, my face was scanned. A hominid skull was scanned. We digitally transplanted the face over the skull, constructing a third face, one that is post-hominid but pre-human in form. A scaffold of ABSi thermal plastic was formed using a 3D printer. The scaffold was seeded with living cells. The PARTIAL HEAD is a partial portrait of the artist, partially living. It’s life-support system was a custom engineered bioreactor, incubator and circulatory system which immersed the head in nutrient kept at 37 C.
The WALKING HEAD is a 2 m diameter 6-legged autonomous walking robot. 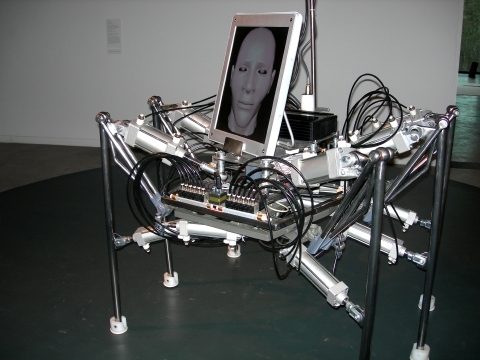 Vertically mounted on its chassis is an LCD screen imaging a computer generated human-like head. The robot has a scanning ultra-sound sensor that detects the presence of a person in front of it. It sits still until someone comes into the gallery space- then it stands, selects from a set of movements from its library of preprogrammed motions and performs the choreography. It then stops and waits till it detects someone else. The robot performs on a 4 m diameter platform and its tilt sensor system detects when it is close to the edge and backs off, walking in another direction. The Walking Head robot will become an actual-virtual system in that its mechanical leg motions will actuate its facial behaviours of nods, turns, tilts blinks and its vocalizations. The recent projects tentatively and imperfectly explore alternate anatomical architectures that incorporate physiologically plausible structures and re-wirings. They also postulate hybrids of biology and technology and actual-virtual chimeras. Operational and living systems as mixed and augmented realities. In so doing it exposes the obsolescence of the body and questions its present form and functions.